Cause and effect is tricky to understand and even harder to explain, but so vital for preventing problems! 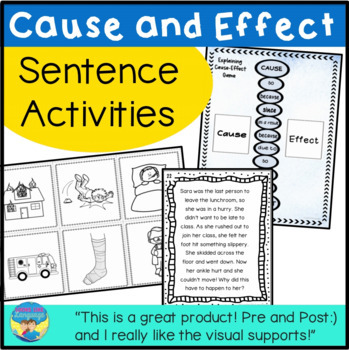 Build your students' skills with this multi-activity black and white set with 66 pictures and matching sentences, determining whether phrases are cause or effect, thinking of multiple causes and effects to build flexible thinking, a spinner game, a board game, passages with problem solving and inferences, and worksheets, too! * LOW PREP pages: mostly in black and white to just print, cut and play or view on devices to discuss. * Pre/post data collection ideas and response sheet. * Strategy cards for 1-3 causes and effects. 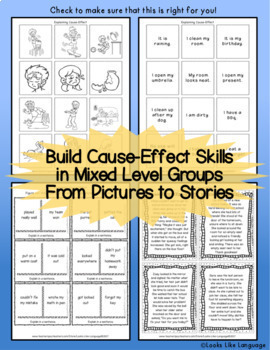 * 66 cause-effect picture cards. * Matching phrase cards for use with the picture cards to improve listening comprehension skills. * A printable game board to play or color. * Social problem passages to discuss varied causes and effects that include emotions and using inference skills for higher level practice. * 10 worksheets at varied levels to practice all the skills in the packet. What are happy buyers saying? 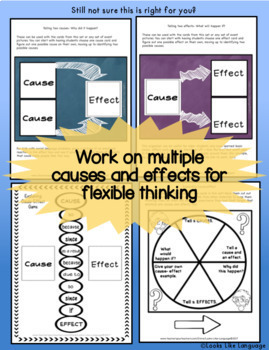 + So excited to bring these activities to my friends who are struggling with cause and effect! This skill impacts so much of their lives, the number of activities is excellent for teaching and the games look like they will be a fun way to practice new skills! + Love that I can use this as a game. Great for tutoring! Great review! + This is a great product! Pre and Post:) and I really like the visual supports! Be sure to check the detailed preview to see if this is right for you! Still not sure? Just ask a question at my store and I'll be happy to help! It pays off to give feedback! You earn credits toward free TpT purchases when you do, and your kind words bring a smile to my day! I love happy feedback and encourage you to ask a question at my store if something isn't right so I can fix it.